WBO World Middleweight Champion Billy Joe Saunders is training in Marbella, Spain with former Heavyweight ruler Tyson Fury. The undefeated Hatfield star posted a video onto his Instagram page this morning confirming that Fury is back in training. This week Fury revealed that he is targeting a comeback this summer in a quest to regain his status as World Heavyweight Champion. “Got the big man with me,” said Saunders. “Tyson Fury is running with us, getting in good shape – he’s lost weight already. In November 2015, Fury upset the odds to dethrone long-time division king Wladimir Klitschko. The 28-year-old remains the Lineal Champion ahead of his proposed return to the ring. Saunders is set to face Avtandil Khurtsidze in July after the Georgian stopped Tommy Langford in Leicester to lift the WBO Interim belt. 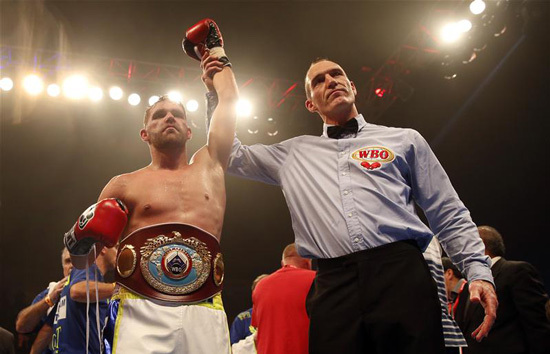 Khurtsidze, a heavy-handed Georgian, is an avoided man in the division and will be confident of defeating Saunders. Billy Joe has been forced to look at other options after a proposed unification bout with Gennady Golovkin seems unlikely to materialise this summer.